Spring and summer bring us all kinds of delicious fruits in our garden. I love turning them into jams. I wanted to make some space for new jams on my shelves, so I needed to find a recipe to use up my old ones. I had made a blueberry-jam cake last year, and it is a great way to give a regular bundt-cake a fruity taste and moist texture. This time I used a Greengage-Vanilla jam. Greengage is a kind of plum, they are smaller than regular plums and their color is green. It is a very tart fruit, so they make really good jam. I have used the same jam to make a crostata before. I decided to make a sheet cake this time. The recipe is adapted from Cake Keeper Cakes by Lauren Chattman. In the book she used apricot-jam. 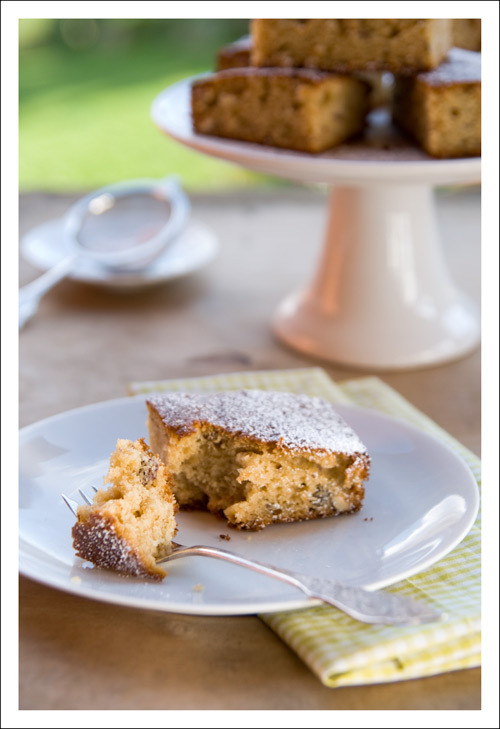 In addition to the jam, the cake contains toasted hazelnuts, which give the cake a good crunch. You can keep the cake for a couple of days under a cake dome at room temperature. Preheat the oven to 180° C degrees (350° F). Grease a 24-cm (9-inch) square baking pan. Whisk together the flower, baking powder, cinnamon and salt. In another bowl, using a mixer, cream the butter together with the sugar until fluffy, for about 3 minutes. Beat in the jam until smooth. Now add the eggs, one at a time, beating for about 30 seconds each time. Add the sour cream and mix until smooth. Slowly add the flour and beat until combined. At the end fold in the nuts. Pour your batter into the prepared pan and bake for about 50-60 minutes. Test with a toothpick in the center of the cake, if it's done. 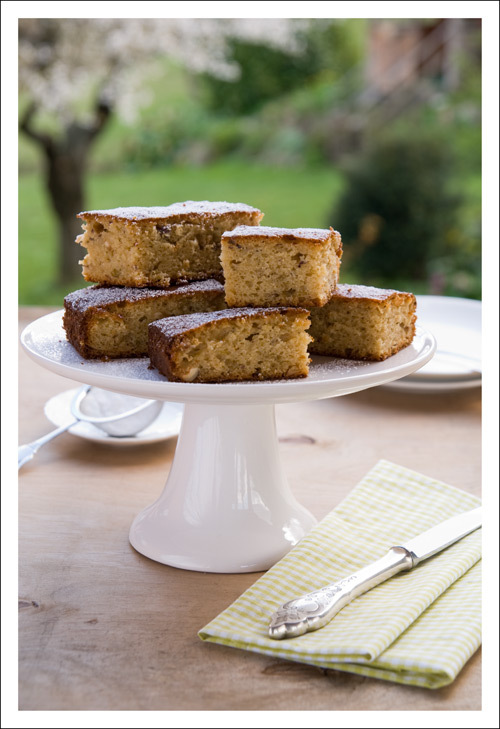 Let cake cool in the pan first and then transfer onto a wire rack to cool completely.